Read up about the place a couple of weeks back and since I was in the neighbourhood, I decided to head towards the tuckshop during my “recess” time yesterday. Let me tell, you they serve the most awesome steak sandwich evar. The first bite itself was an unforgettable experience, the meat was juicy and succulent, and with the soft yet not so soft toasted focaccia, the whole bite just practically melts in your mouth. And the follow-up bite, this time with a taste of portobello in the mix, just leaves you wanting for more. And the best part is that they have this chilled fermented barley drink called Asahi at only $4.50! Woot! 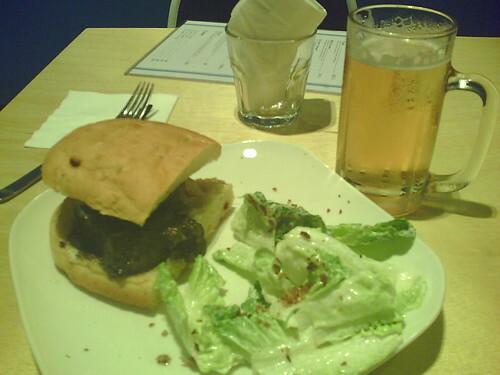 Burger and beer… mmmm…. just had that last night. Yah man, lurrrve the steak sandwich! Too bad about the limited seating though. Leia, so when are we going ah? Jay, I had that for LUNCH. pwnz. Xena, why? Can always sit on my lap mah. Gah. Someone just told me about tuckshop and raved about their steak burgers as well. Damnit. Now I want to eat some cow.